After a relatively short 5-hour bus trip, Chai and three of his friends met me at the Mae Sai bus stations. His friends had arrived earlier in the day and had set to celebrating upon their arrival. Introductions were made and beers were offered. After the disbelief that I don’t drink wore off, they bought me a Coke and it was “cheers” all around. With popular Thai music playing loudly from Chai’s van parked next to our table, we sat and drank for a while and enjoyed making new friends. After dinner at Siri Café and Restaurant, a location I would become extremely familiar with over the next 48 hours as that is where the wedding was held, we headed to Chai’s sister’s house. The table was brought out of the house, beer, ice and Coke were procured, and what could be considered the equivalent of a Thai bachelor party ensued. As the evening progressed, more and more of Chai’s friends joined in the festivities. Over the course of the evening there were plenty “mot gao” cheers, which basically means to finish your drink in one shot. The few that could speak English just started saying “one shot”. It was always a laugh when I would say it, since drinking water or Coke, it was no problem for me to finish my drink in one go with no consequences. Three cases of beer, several bottles of water, one 1 Liter bottle of coke and many hours later, the celebrations wrapped up. Because several people were coming from out of town, Chai had made arrangements at a guesthouse not far from Fai’s, his bride, house. The room was spacious and the bed was incredibly firm, even by Asian standards of firm. Laying on the bed was something akin to sleeping on a tile floor. As I lay down to sleep, the caffeine from all of the Coke consumed that evening kicked in and was awake until almost 2 AM. The sun broke through the thin curtains around 6 AM. Saturday was devoted to a constant whirlwind of wedding preparations. After breakfast at Fai’s house, we were on our way. Making the rounds of Mae Sai to pick up Chai’s friends, most of whom were still feeling the effects of the previous evening’s libations or had flown in from Bangkok early that morning, we ended up at Siri Café and Restaurant. The women were fast at work decorating the courtyard with colorful balls made out of tissue hung on silver strings from the trees and setting up the guest registration table and the picture backdrop. The boys were set to work on boy-like tasks. Being a friend of Chai’s, I tagged along with them. First we were sent to the rice farm for bamboo poles. We piled in the van and headed the short distance outside of Mae Sai to Chai’s family farm. Almost effortlessly, 6 sections of bamboo were cut to about a meter long and one end sharpened to a point. At least for Chai’s father it seemed effortless, a couple of the boys put a bit more labor into it. Then it was on to Chai’s sister’s house for ladders. The concrete dais where the ceremony would be held was transformed with pink and blue curtains hung to form a backdrop where there was no wall and a big sign saying F & C and the wedding date was hung on the wall. Green and white bunting was laced along the railing. Carpets were laid down and 5 chairs for the monks were set up. The small puzzle of tables that form an alter were dusted and assembled. Plants were moved out of the way and replaced with fake flower arrangements. Fluorescent lights were the subject of some debate about how they should be hung and what electrical was needed. People were sent on errands to get the items that were thought to be needed. Most impressive was the 10-foot pole of conduit the one person brought back on their motorbike. Around noon, Chai needed to head to the Chiang Rai airport to pick up another friend that was arriving for the wedding. Not thinking that I would need it, I had left my passport at the guesthouse. On the road to Chaing Rai from Mae Sai is a police checkpoint, and as Chai drives a tourist van, the probability is high that he would be stopped for them to check for passports and visas. Since I didn’t have my passport, Chai left me in Fai’s care. Our first task was shopping for a few remaining items needed for the wedding: balloons, small bottles of mosquito spray, towels, and paper trays. Dee, Fai’s friend who is an English teacher, provided the translation along the way. After finishing preparations at Siri, we headed to Dee’s house to assemble the VIP gifts. The VIP gifts were towels, placed in a paper tray and tied with a ribbon. These gifts would be presented to each of the people who are considered VIP guests. We created some version of an assembly line, folding 50 of the paper trays while Wande and Dee figured out how best to fold and tie the ribbons. In short order, the gifts were assembled. Deciding what to wear to a Thai wedding had been a point of concern for me as I was packing for my trip. Everything I had researched said to absolutely NOT wear black to a wedding. To do so could be almost insulting. Even in this time of mourning for Thailand, I felt this rule should hold true. In the course of conversation with the ladies, the question was brought up as to if I would be wearing a traditional Thai outfit. Initially I explained that I had brought a dress. Then later, after much consideration on my part, I asked if maybe I could wear a Thai outfit. Returning to Fai’s house, she set to trying to find a skirt that would fit my western physique. The only one she found was a black and red skirt. Starting to feel overwhelmed I began to wish I hadn’t asked about a Thai outfit. The language barrier made it hard for me to express my wish that I could show Fai the dress that I had brought to ask if it would be ok. So after great debate about what to wear for the wedding and showing Chai and Fai my dress and getting a thumbs up, I reached my breaking point of exhaustion. Only 4 hours of uncomfortable sleep combined with the constant flurry of the day had worn me down. Chai and I decided it was best for me to take a rest and that I should call him when I woke up and he would take me to the night market to get some dinner. Setting my alarm for 6:30 PM, I laid down on my unyielding bed and promptly passed out. At 6:30 my alarm gently nudged me awake. Knowing that if I didn’t call Chai around 7 he would begin to worry about me wasting away for lack of food, I groggily got up and ready to go. Chai took a break from his wedding invitation preparation and drinking with the boys to come pick me up on his motorbike and take me to the night market for food. On Saturday nights, half of the main street in Mae Sai is transformed into a night market. Here we had kow phon un, an interesting dish of rice noodles and purple rice noodle paste flavored with cilantro and lime and chili pepper (and I’m not sure what else as Chai assembled my dish for me) for dinner. For dessert, Chai bought me grilled sweet sticky rice, a purple patty of sticky rice that is grilled, sprinkled with palm sugar and rolled up in a banana leaf. All of it was delicious. After eating. I convinced Chai that I would be completely capable of walking back to the guest house by myself after wandering the night market so that he could return to his time with the boys. At the market, the Thai skirts were 100 baht (about $3) and after much consideration, I decided to buy a turquoise blue with gold pattern one as an option to wear the next day. Knowing that Chai would be busy with delivering the wedding invitations and spending time with his friends, Fai invited me to join her and her friends at her house. After returning to the guesthouse, and Chai coming by to give me my invitation and to make sure I made it the 1.3 km (0.8 miles) back from the night market, I went to Fai’s. A few of Fai’s friends speak English, and Dee generally was the translator for the ones that were either too shy or genuinely don’t speak English. We had simple conversation over more food and beer and water. Still tired and knowing it was an early morning the next day, we wrapped up around 9:30 PM. A Thai wedding is an all-day affair complete with monks, a procession, pictures, traditional Thai dancers, 2 wardrobe changes, food, karaoke, and lots of drinking. When Chai invited me to the wedding, he said it wasn’t going to be a big affair. To me, it appeared to be a big and involved affair. Perhaps he meant that it wasn’t going to be as lavish and drawn out as weddings in other areas of Thailand. Fai’s first dress was a traditional Thai dress of gold with a sash of red silk and gold lace draped off her shoulder creating a type of train. The 5 friends in the wedding party were dressed in a similar style dress with a pale green skirt, gold belt, tan top and a shorter, more simple version of the sash drooped gracefully off their shoulders. The courtyard of the Siri Restaurant had been transformed that morning with balloons, umbrellas, white table cloths and chair covers with big gold bows. The setting was beautiful. The day started with a copious number of pictures of Fai and Chai, the wedding party, the couple with their families, the couple with some friends, all in a variety of poses that seem so natural for Asians. I’ve tried to adopt some of the head tilts or hand gestures, and no matter what, I think I just look silly when I try. Two official photographers and a plethora of smartphones captured as many moments as possible. The first part of the ceremony is performed by monks from the temple. The five monks appeared and in a procession, Chai and Fai placed an offering in each of their alms bowls. After they took their place on the dias, Chai and Fai lit the candles on the little alter and the ceremony began. Not having someone to translate or any “Guide to Thai Weddings” to reference, I can only guess at what was being chanted or the symbolism behind the ceremony. Mostly I followed what the other attendees were doing. Placing my hands in a wai (prayer position) when the others did. I do know that at one point the monks performed a chant that would put any Catholic wedding homily to shame as far as duration. Maybe it just felt incredibly long because those of us sitting on the dias, mostly family and VIP people, held their hands in a wai the entire time. About half way through my shoulders and mid-back started to grumble, yet I persisted. After the long chant and the attendees were blessed with the sprinkling of water while more blessings occurred. Eventually, Chai and then Fai received blessing strings from the head monk on each of their wrists. Finally, the wedding couple made offerings of food to the monks. Next was the procession of Chai’s family from the temple, located a couple blocks down the street, back to the restaurant. Chai at the front carried a large flower arrangement, flanked by his mother and father carrying gold trays that had been decorated. The rest of his family followed. Bringing up the rear was the traditional band of drums and symbols that accompany any procession in Thailand. Along the way there was dancing and cheering. Arriving at the restaurant, Chai faced several “gates” where tasks had to be performed, and an occasional bribe to be paid, to get to his bride. The gates were garlands of flowers or gold cord held by Fai’s friends and family members. 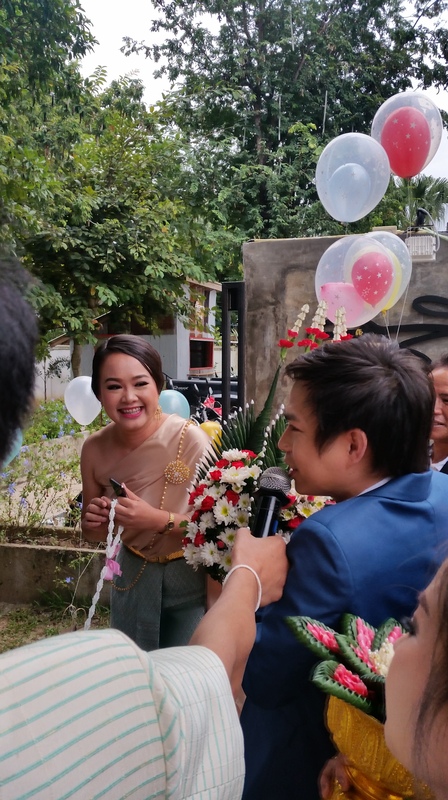 At the first gate, Chai had to loudly (he was given a microphone) profess his love by calling to his bride. When the friends were convinced he had performed the task sufficiently, he was allowed to pass. Next was a proof of strength. Donning sunglasses and taking a shot of whiskey, Chai had to perform 10 pushups to the count of those gathered. At the third gate, had to place an arm behind his back, bend over touching the ground with his fingers and spin around. I believe an additional bribe was needed to pass the gate, as there was a moment of searching in his mom’s purse for an envelope. 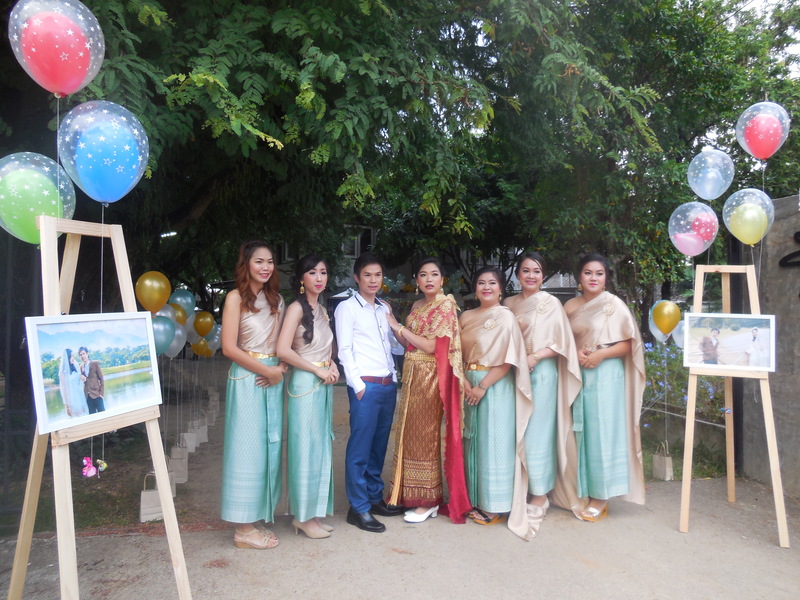 At the last gate, the dowry was presented to Fai’s mom. Large stacks of money and the rings, bracelet and necklace were placed on the trays his parents had been carrying and presented to the last gatekeepers. As part of the tradition, the bride’s family said it was not enough so more money was placed on the tray. In the end, it was deemed sufficient. Chai passed the arrangement to Fai, and in return, Fai gave Chai a similar arrangement. After presenting the dowry and the exchanging of rings. The dias had been transformed for the second half of the ceremony. The monk chairs had been removed. Chairs had been placed in a row and the kneeling benches had been arranged for the couple under the F & C sign that had green and white bunting draped behind it. The bride, groom and parents took their places on the dias, parents on the chairs and the couple on the ground. The children paid honor to the parents, first to their own parents, then to the other’s parents. The dowry was officially passed from Chai’s father to Fai’s father. Then Chai put the necklace, bracelet and ring on Fai. She placed his ring on his finger. And at the end, she bowed to Chai, placing her hands on his leg and her forehead to her hands, while Chai wrapped his arm around her. After a final blessing, from what I would interpret as a welcoming to the family, the couple took their place on the kneeling benches. First they received three blessing dots in gold on their forehead. Garlands of small white flowers were placed on their head, the garlands connected with a string of small flowers. Matching flowers on ribbons were placed around their necks. Once they were ready, the VIP guests were invited to come forward and wrap a blessing string around their wrists. A literal tying of the knot. The string symbolizes the binding of everyone together in a collective family. As one of the VIP, I was honored to get to put a blessing string around my friend’s wrist. After the ending of the ceremony, the couple were whisked away in a van. About the same time, the skies opened up and rain poured down. In some cultures, rain on your wedding day is considered good luck. If this is true, Chai and Fai were showered with an abundance of good luck. The guests took shelter anywhere they could, the audio equipment was covered with a tent, and the performers took to the stage. Songs were sung while Thai dancers performed beautiful dances, keeping their composure in the pouring rain. Food was served to the various groups of gathered attendees and the bottles of beer and whiskey (and Fanta, Sprite and Coke) were opened. While waiting for the couple to reappear, a large truck appeared with large event canopies on them and the men set to work as an efficient machine erecting them as quickly as possible. The rain soaked table cloths and chair covers were removed, and guests moved out into the courtyard to continue eating and drinking. The newlyweds reappeared. Fai was now dressed in a more western-style dress of white with a beaded top and tulle skirt and a veil in her hair. Both were wearing the flower garlands that had been placed on their neck in the last part of the ceremony. The couple, accompanied by a couple of the ladies from the wedding party, made their rounds to each of the tables of guests. Some of the guests that had not given them their wedding gifts, gave them to the couple at that time. The typical gift in Thailand is money. Your gift is placed in the envelope that your invitation was delivered in, typically with your name on the outside of the envelope. In exchange, the guests are given a token gift. Passing a coin between them. Kissing in public is not common in Thailand. So to see the couple kiss, friends would give them a coin. 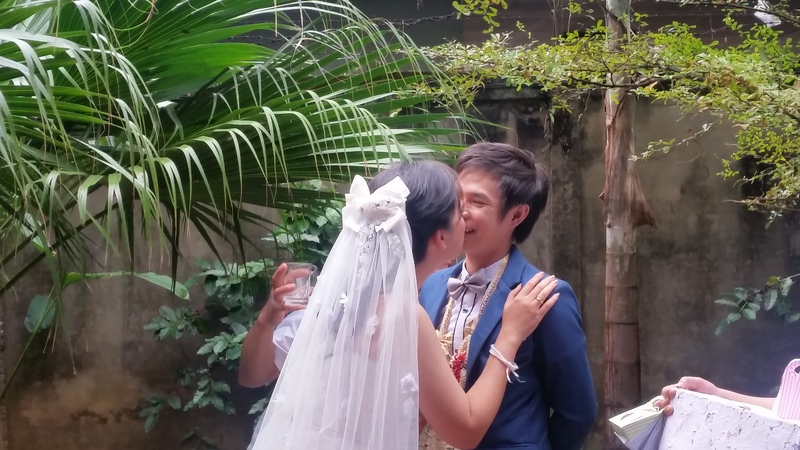 The groom puts the coin between his teeth. Then the coin is passed to the bride without using any hands. Typically, it is the younger friends that will do this to the couple. Often this ritual is preceded with a shot of whiskey chased by water. With the ceremony and formalities complete, the couple made one more wardrobe change. This time was to a more casual look of the white wedding t-shirts with C&F and 27.11.16 printed on them in pink that had been given to their closest friends. Fai kept the veil in her hair and changed into a knit skirt and tennis shoes with her t-shirt. Then the celebrations began in full force with lots of drinking and eating. Karaoke was performed, including Chai singing a song for Fai and her returning the favor. Over the course of the next several hours, liters upon liters of beer and whiskey were consumed. The newlyweds continued to make the rounds, visiting and taking pictures with their guests. Around 6:30 PM, the celebration migrated to Fai’s house for the majority of the younger crowd. People that weren’t able to make the wedding came by as well. As with any Thai gathering, food and beverages prevailed. Fai cooked a little food and a couple of the women hopped on a motorbike for a trip to the night market, especially because they were concerned that I wouldn’t have anything that I could eat. Som tam (papaya salad), noodles, fried rice, and fried bamboo worms, a northern Thailand delicacy, graced the table. The fried worms tasted like a French fry with the texture of a cheese puff. Far easier and better to eat than the friend crickets I have had on past trips. With the flurry of the wedding over and knowing the newlywed couple would be sleeping off hangovers, I was on my own for Sunday morning. Waking later than the previous days thanks to a rainstorm that made a soothing sound on the roof and kept the early dawn light from breaking through the thin curtain. With my journey home starting today and planning to leave Mae Sai around noon, I showered and packed my suitcase and backpack, then walked into town for breakfast. The woman selling pauk se (steamed buns filled with either pork and egg or sweet bean paste) smiled at me as I walked by. I don’t think many of the tourists that come to Mae Sai on the Golden Triangle Tours or for their visa runs (a trip over the border to renew the 30-day Thai visa on entry), make it as far back into the neighborhoods as where I was staying. I continued on into town, stopping at the Chinese temple, apparently dedicated to frogs as far as I could tell from the statuary, along main street for a quick look around. On my walk, Chai did call to make sure that I had managed to get food and to confirm that we would be leaving around noon. Assuring him that I was fine, I continued my stroll for a bit. A little later, Chai called again to inform me that plans had changed and that we would be leaving in 20 minutes because Fai’s family wanted to stop at a tea farm for pictures on the way to the airport. In a humorous exchange where Chai wanted to come get me on the motorbike and me explaining that I had no idea what street I was on but that I wasn’t far from the guesthouse, I assured him I would be back in less than 20 minutes. Picking up my pace from a meander to a walk, I stopped for Thai iced tea and 2 pauk se (one pork and one sweet bean paste), and made it back to Fai’s house in 12 minutes. 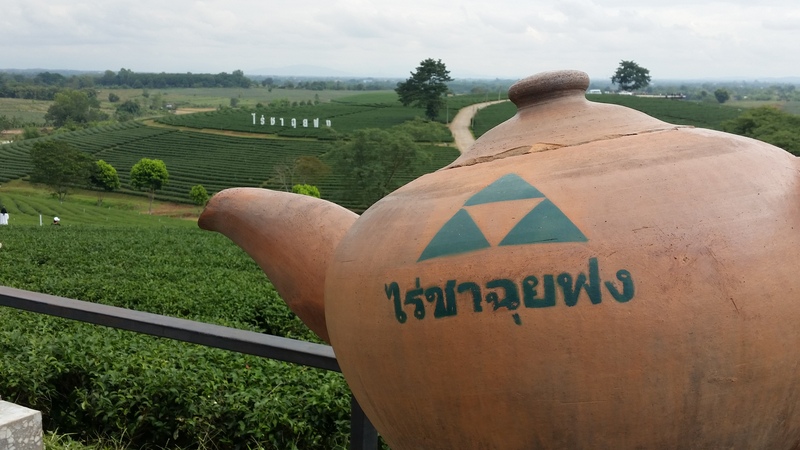 The Choui Fong Tea Planation is draped over the hills outside of Chiang Rai. The lovely rolling hills with the very neat rows of tea plants make for a beautiful backdrop for pictures. Big white letter signs on the hillside announce Choui Fong (in both English and Thai) and a white temple is situated among the dark green leaves of the tea plants. We made a couple of different stops for picture taking. In addition to not mastering the art of posing for pictures, I have also not managed the art of selfies. Fai’s cousin had a selfie stick, which did aid in the process, especially for getting the whole family in. Fai’s aunts made sure I was in plenty of the shots. My travel clock begins from the time I arrive at the first airport on my journey. For this trip, that was the Chiang Rai airport. Fai’s family’s flight was about an hour before mine, so we arrived at the airport around 1 PM. Over the next 43 hours, I would be slowly making my way home via Bangkok, Beijing, and San Francisco. Bangkok Airways, Thailand’s boutique airline, is impressive in their service. At the airport, they had free beverages (water, orange drink, Thai iced tea, and iced coffee) and a variety of snacks available for their passengers. On the plane, they manage a complete meal service in the 1 hour and 5 minute trip. This flight was my shortest and probably most pleasant of the four I would take on my journey home. My first layover was in Bangkok. Having approximately 5.5 hours from when I claimed my luggage to when I needed to be back to check in for my flight, I decided to make a trip into the city. Leaving my luggage at the Left Luggage counter, I set about getting the train into the city. I am not a fan of Bangkok and wasn’t sure where to go with my time that evening. Looking at a map I decided to head to some night markets. The first market I chose to go to was Khlong Thoei Pier Market, thinking this market would be something akin to the regular markets that pop up all over Thailand when the sun goes down with food stalls and shopping. To my surprise, it was nothing of the sort. Khlong Thoei Pier Market is one of the largest food markets in Bangkok. Located very close to the water, the smell of fish and the ocean mingled with the smells of raw meat and vegetables. After a very fast walk up and down a couple of the rows of stalls and sloshing through water on the ground that I chose not to contemplate what was in it, I headed back to the Metro and on to another market. Patpong Night Market was also not what I was expecting. This night market is one of those that gives Bangkok and Thailand it’s darker reputation of girly shows and knock off designer purses. My senses were overwhelmed and horrified by the neon lights and the names of some of the girly bars on the sois (alleys). Again, I made a rapid venture of the market, avoiding the hawkers of purses and watches and other tourist knickknacks, and headed back toward the Metro station. My initial plan had been to go to a night market, find some food and get a massage. By the time I got back to the Metro, I happened to notice the massage place, but only had about 30 minutes to spare. Even 30 minutes of a foot massage was better than nothing. Returning from the city, I claimed my luggage, changed into jeans and transferred anything I thought that would keep me warm into my backpack. My flight wasn’t open for check-in so I found a place to charge my phone and wait. When I did make my way up to the check-in counters, I discovered a very long line for the Air China flight. I wasn’t worried about making it through security or to my plane on time, I was worried about not having enough time to charge my phone before the flight, knowing that I was going to need it in Beijing. My second layover was 9 hours in Beijing. Fortunately, China allows a 72-hour visa free transit, meaning you can leave the airport so long as you have a flight booked and continue your journey within 72 hours. Arriving at 6:30 AM, the temperature was -5C or 23F. Avoiding the tour operators offering their services as I walked out of the baggage claim, I filled my water bottle with hot water from one of the water machines and found a place to charge my phone since the plugs on the plane weren’t working and I was down to 6% battery. When the battery reached about 25% full, I headed off on my journey. Getting into the city and to the Lama Temple was very quick and easy using a combination of the Airport Express train and the Metro. The Lama Temple (or Yonghe Temple) is a temple and monastery for Tibetan Buddhist monks. 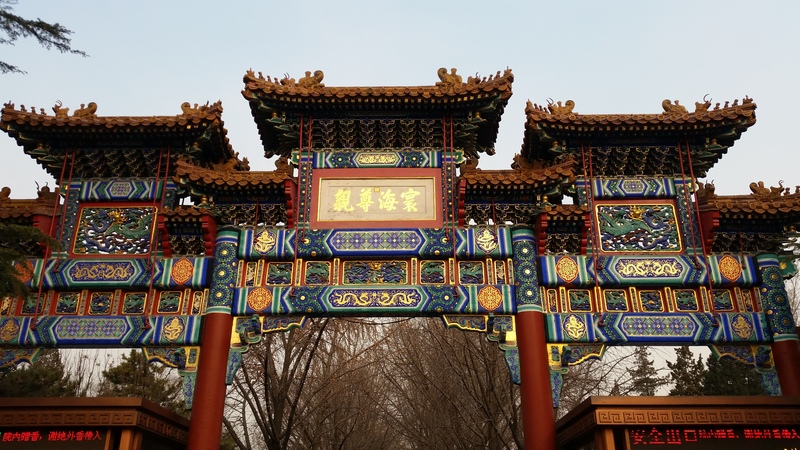 The red buildings and gates with decorations of blue, green, white and gold were a colorful oasis against the backdrop of the barren trees and wintry skies. On the way into the temple, visitors pick up a package of incense. In front of each of the five main halls, crowds of people lit their incense sticks and made prayers before entering. The cloud of incense smoke lingered in the air and clung to my clothes. I worked my way through the 5 main halls, and a couple of the additional buildings, admiring the Buddha statues and making a concerted effort to try to stay warm. My sweatshirt, scarf, hoodie, t-shirt, jeans and thin socks and shoes did their best to fight the wintry cold, albeit not very successfully. To say I wasn’t envious of the warm coats and hats on the other visitors to the temple, would be lying. Even the monks looked warm in their dark red thick winter robes. Behind the Hall of Heavenly Kings, the first of the halls, was a wishing statue. Wishes are made by throwing a coin onto the statue, with the goal being that your coin actually land on the statue, closer to the top the better, for your wish to be granted. My coin landed on the first try about half way up the statue. The most impressive Buddha statue was in the Hall of Boundless Happiness (or Pavilion of Ten Thousand Happinesses). The Maitreya Buddha holds the Guinness Book of Records for being the tallest Buddha carved from a single piece of White Sandalwood. The incredible statue is 18 meters (59 feet) tall with an additional 8 meter base underground. After wandering the temple, I ventured out into the neighboring streets in search of food. The first houtong area I walked in was entirely residential. The next one, closer to the main street, was a more artsy houtong, with the trendy looking bars and restaurants opening in the evening hours. I ventured into a few shops selling Buddhist goods along the main street, mostly to try to thaw my frozen hands and warm my face. Eventually I opted for a Costa Coffee coffee shop, where I bought a vanilla latte and a piece of coffee cheesecake for 63 Yuan, which is a bit expensive but for the opportunity to sit in a heated building, I was more than happy to pay the price. After I regained feeling in my hands, I headed back to the airport. Two more flights and a short layover in San Francisco completed my journey home. Having my sweetheart greet me at the airport, was the perfect ending to my whirlwind 8-day trip to Thailand. By the time my head hit the pillow, I had been mostly awake for 47 hours and had traveled on 4 planes, 2 airport trains, and 5 metro/subway trains in three countries. Even for such a short trip, I am happy that I made the journey for my friend’s wedding.